For your safety do not rush for your train. Please switch your mobile phone to silent mode. 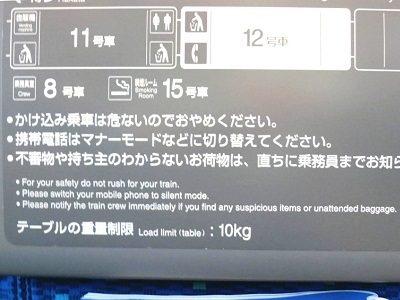 Please notify the train crew immediately if you find any suspicious items or unattended baggage. Flush in the toilet after use. No disposal except provided paper. Touch to flush after use. For spare paper roll, push down the lever. Please dispose of the used paper core in the sanitary napkin disposal. Smoking or the use of a lighter will activate the fire alarms.